Currenn Mackie-Malcolm (left), Robin Pelkey (middle), and Gabby Cyr (right) with President Susan Hunter after choosing the Real Food for Mainer’s basket. Photo by Aley Lewis, photo editor. President Susan Hunter was given an unusual Valentine’s gift on Monday, Feb. 15. 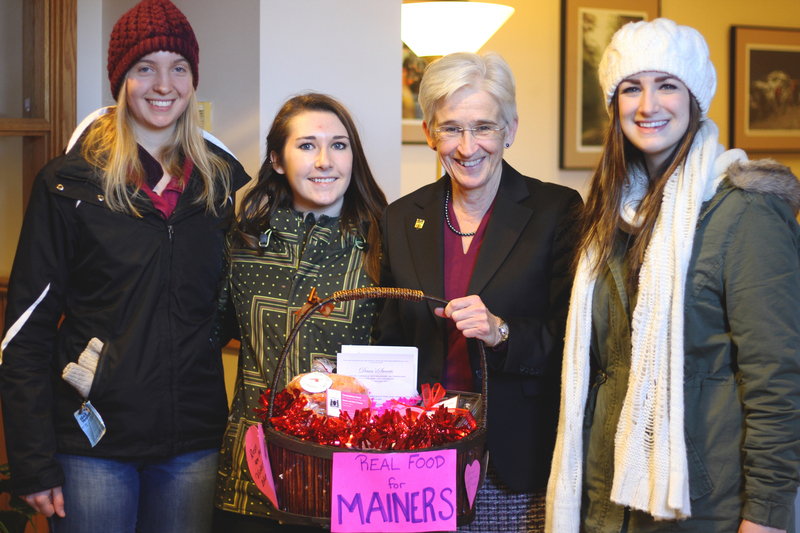 A group of representatives from the Real Food Challenge (RFC) at the University of Maine walked to the president’s office in Alumni Hall, carrying two baskets of Valentines. The Real Food Challenge is not a new group on campus. They’ve been seeking action for the past three years. 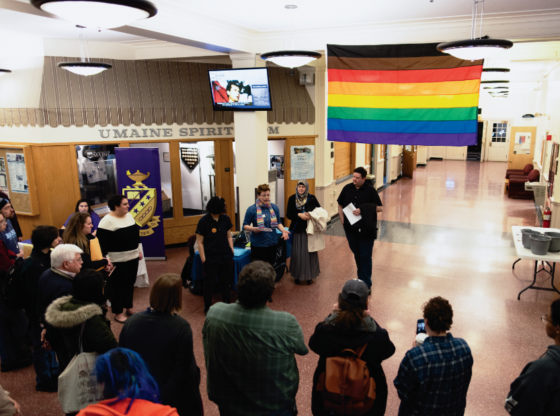 Audrey Cross, the student organizer of the RFC UMaine, and a fifth-year student at UMaine, has been a part of the movement for two and a half years. According to Cross, attempts to meet with former President Paul Ferguson didn’t go well, since he was preparing to leave office. 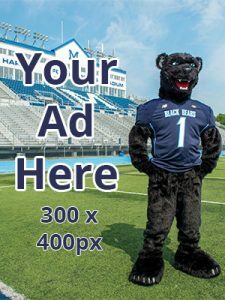 Attempts to meet with Hunter have gone better, but the RFC UMaine members don’t want to be put on the back burner. They’ve committed to escalating their campaign and the Valentine event was a way to open up conversation about their goals and the challenges facing them. 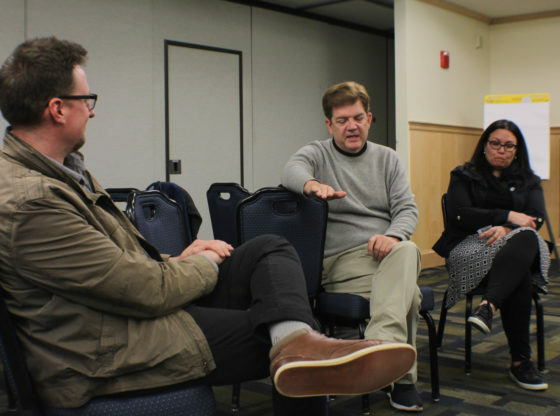 “We want to actually be able to sit down and talk with her about the challenges and how we can overcome them to make real food possible at UMaine,” Pelkey said. The RFC is a national network of student leaders who work to influence campus food procurement. According to the RFC, the term “real” means local, humane, fair and ecologically sound. The name for the organization was chosen based on dictionary definitions. “The word real means ‘something that is true,’ and food means ‘nourishes.’ So real food truly nourishes,” Cross said. The UMaine System has already required all campuses to procure 20 percent local food by 2020. 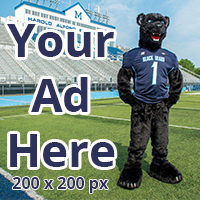 However, RFC UMaine members are afraid that might not be enough. Cross explained that the University of Kentucky went through a similar situation in 2015. The university’s dining contractor, Aramark, met half of their 20 percent commitment by spending $1 million at a local Coca-Cola bottling plant. According to Cross, real and local food should directly support all four parts of the food network: producers, consumers, communities and the earth. 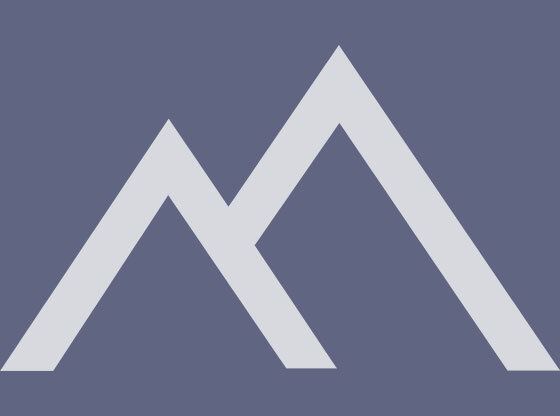 The RFC UMaine has been met with optimism by Dining Services. Glenn Taylor, the director of culinary services, has worked hard to find ways to incorporate real, local food into on-campus meals. Dining Services has also hired a group of Real Food Challenge UMaine students to calculate the feasibility of achieving 20 percent local food by 2020. “The results of this assessment, due to be completed by the end of the Spring 2016 semester, will have a significant bearing on whether or not UMaine, and ultimately the University of Maine System, signs the Real Food Campus Commitment,” Dr. Daniel Dixon, the director of sustainability at UMaine, said. “In the meantime, by virtue of their Valentine’s Day gift to Dr. Hunter, the Real Food Challenge students have successfully placed themselves and their cause on the President’s radar,” Dixon said. Members of the president’s office were not available for comment.